Communicate .. 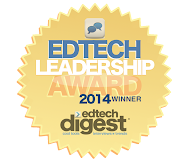 Create .. EdTech: Find Common Core-aligned resources - OER Commons! 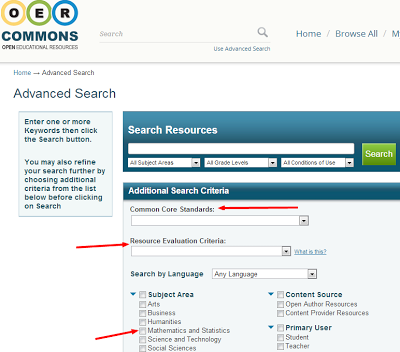 Find Common Core-aligned resources - OER Commons! OER Commons' Advanced Search function allows the user to find Common Core aligned lessons by grade and then 'domain' - for example 'geometry' - easily. Many more resources on other subjects, too. The search page includes a wide variety of criteria beyond CC standards - subject, etc. - and the ability to search for 'interactive' tools, videos, assessments, simulations,and more. That was impressive. CC Connection: if you're looking for a lesson or other 'resource' - videos, assessments, case studies, even textbooks - this could be just the ticket to quickly find something effective to use from quality sites like Khan Academy, Geogebra, Edsitement, The Library of Congress, and many others. Sign up, and save the resources you want for later perusal. Definitely worth a look and a bookmark. This resource is a keeper.